RONAN — The VFW Auxiliary 5652 of Ronanchose Safe Harbor for 2016’s “Make a Difference Day” recipient. Safe Harbor was recognized for doing so much for our community. 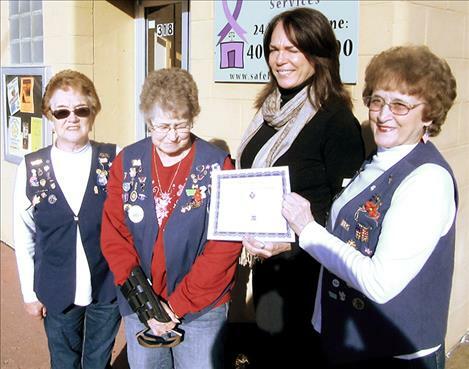 The Auxiliary presented Safe Harbor with a Certificate of Appreciation and $100. Pictured from left: Trustees of the VFW Auxiliary, Jessie Merwin and Peggy Cote-Smith; DeeAnn Richardson, Executive Director of Safe Harbor; and Margaret Fay, President of the VFW Auxiliary.